In December 2015, nations of the world took a giant step to combat climate change through the landmark Paris Agreement. But African experts who met in Nairobi, Kenya at last week’s Seventh Conference on Climate Change and Development in Africa (CCDA VII) say the rise of far-right wing and nationalist movements in the West are threatening the collapse of the agreement. 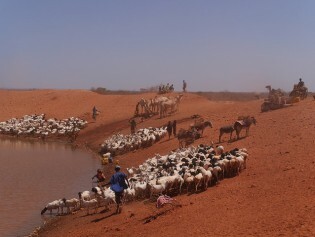 Faced with worsening droughts due to climate change, Ethiopia is joining an international initiative seeking to build global resilience against the problems caused by it, and enable developing countries to become part of a united solution to the ongoing problem. Will Climate Change Cause More Migrants than Wars? Climate change is one of the main drivers of migration and will be increasingly so. It will even have a more significant role in the displacement of people than armed conflicts, which today cause major refugee crises. As negotiators concluded ten days of climate talks in Bonn last week, climate finance was underlined as a key element without which the Paris Agreement’s operational guidelines would be meaningless. “Five years ago, when we first started talking about including gender in the negotiations, the parties asked us, ‘Why gender?’ Today, they are asking, ‘How do we include gender?’ That’s the progress we have seen since Doha,” said Kalyani Raj. Will Policymakers Listen to Climate Change Science This Time Around? Climate change is altering the ecosystem of our oceans, a big carbon sink and prime source of protein from fish. This is old news. Despite the fact that Central America is one of the regions most vulnerable to climate change, it has half-empty coffers when it comes to funding efforts against the phenomenon, in part because it receives mere crumbs in foreign aid to face the impacts of the rise in temperatures. Global climate change policy is in a state of flux, with all other countries waiting for the United States to decide whether to leave or remain in the Paris Agreement. With the ratification and entry into effect of the Paris Agreement still fresh, the countries of Latin America are heading to the climate summit in Marrakesh in search of clear rules that will enable them to decarbonise their economies to help mitigate global warming. London’s Waterloo Bridge over the River Thames is famously known as the “Ladies Bridge,” for it was built largely by women during the height of World War II. On another continent, women fighting a different war have built an equally remarkable structure: a 3,300-meter anti-salt dyke constructed by a women’s association in Senegal to reclaim land affected by rising levels of salt water. "Why don’t the authorities put themselves in our shoes?” asked Cándido Mezúa, an indigenous man from Panama, with respect to native peoples’ participation in conservation policies and the sharing of benefits from the protection of forests. The countries of Latin America will flock to sign the Paris Agreement, in what will be a simple act of protocol with huge political implications: it is the spark that will ignite actions to curb global warming. The agreement reached in December, 2015 at the 21st Conference of the Parties under the United Nations Framework Convention on Climate Change (UNFCCC) is a major step forward in dealing with the challenge of climate change. The very fact that almost every country in the world signed off on this agreement is a major achievement, credit for which must go in substantial measure to the Government of France and its leadership. However, in scientific terms, while this agreement certainly brings all the Parties together in moving ahead, in itself the commitments that have been made under the Intended Nationally Determined Contributions (INDCs) are quite inadequate for limiting temperature increase to 2 degrees Celsius by the end of this century relative to pre-industrial levels. One of the most significant aspects of the international conference on climate change, concluded in Paris on December 12, is that food security and ending hunger feature in the global agenda of the climate change debate. The impossible was made possible. Governments from 195 countries around the world emerged here with the first universal agreement to cut greenhouse gases emissions and reduce the negative impacts of climate change. Women Leaders agree COP21 Must Have “Gender-Responsive” Deal. 53-year old Aleta Baun of Indonesia’s West Timor province is a proud climate warrior. From 1995 to 2005 she successfully led a citizens’ movement to shut down 4 large marble mining companies that polluted and damaged the ecosystem of a mountain her community considered sacred. After their closure in 2006, she became a conservationist and restored 15 hectares of degraded mountain land, reviving dozens of dried springs and resettling 6,000 people who were displaced by the mining. Residents of Rocky Point, a sleepy fishing village on Jamaica’s south coast, woke up one July morning this year to flooded streets and yards. The sea had washed some 200 metres inland, flooding drains and leaving knee-deep water on the streets and inside people’s home, a result of high tides and windy conditions. Paris has finally arrived. During the next two weeks, a massive conference centre in the outskirts of the French capital will play host to the ultimate United Nations conference and the single most important climate change event in decades. Extreme weather conditions, an impact of climate change faced by African countries despite contributing the least global emissions, is attracting the attention of many as the clock ticks towards the start of the 2015 United Nations Conference on Climate Change (COP21). Climate Change needs to be at the top of the country’s agenda, according to a project examining Uganda’s policies. It says the country hasn’t paid enough attention to climate change in national development and agriculture plans and this needs to be turned around before it’s too late.